The second article "Editorial: Art Licensing Myths continued (myth #7 to #12)" discussed: (Myth #7: An artist must have an agent or manufacturer sign a Non Disclosure Agreement (NDA) before showing art. Myth #8: Agents not only manage the business part of licensing but track trends, guide the artist in what art to create, and critics it. Myth #9: There is a manufacturer art size and file format standard. Myth #10: There is a standard time of the year for submitting art to manufacturers. 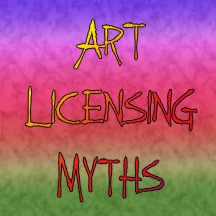 Myth #11: Manufacturers prefer to license art from agents than from individual artists. Myth #12: Participating in manufacturers call-for-submissions (cattle-calls) is a waste of time). This is a continuation of those articles with comments on six more myths. The following is my opinions. Artists, licensing agents and other experts in the art licensing industry may have different ones. It is always a good idea to get several opinions and not depend on only one viewpoint. #13 - You are not infringing on the copyright if you change someone's art 5, 10, or 20%. Infringement of a copyright is when the look and feel of copied original works of art, sculpture etc. are substantially similar. It is an "old wives tale" that you can alter original art by a certain amount and not infringe on the copyright. Read attorney Joshua Kaufman's articles "Don't Be a Copycat." and "Copyrights: How Different is Different Enough?" The well published lawsuit of Allied Press vs artist Shepard Fairey in using a published photograph of Obama to create art for a campaign poster illustrates what could happen to an artist using someone else's photograph or art. I do not think it was ever decided who owned the photograph (Allied Press or the photographer) or whether Shepard Fairey could have used it legally (if his work was substantially different) because the lawsuit got "muddy" and was settled out of court. But do you want to take a chance and end in a lawsuit? Or do you want to get a reputation of copying others art? It is much better to create your own. For more information about the AP vs Shepard Fairy lawsuit, read "AP and Shepard Fairey Settle Lawsuit Over Obama Image; Fairey Agrees To Give Up Fair Use Rights to AP Photos"
#14 Any free clip art and fonts found on internet websites can be used in art and not infringe on the copyright. There are many websites on the internet that advertises that their clipart and fonts are copyright free. But are they really free to be used commercially and are they legally copyright free? Unfortunately some websites lift artists work and display the art as copyright free. And some sites advertise the work as copyright free but the fine print states it is not for commercial purposes. The same is true for fonts. If you are interested in using clip art or fonts in your work, make sure that it is legal to do so by contacting the company that is offering them. Explain that you wish to license your work that includes the clipart and/or fonts and ask if you can legally use them for commercial purposes and copyright the images. I purchase Dover Publication electronic clip art books (includes a CD-ROM) and Mac Fonts from Summitsoft Corporation / Macware Inc. (also available for PCs) that I sometimes use in my work. 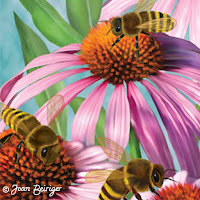 In both cases, I contacted the companies and received written permission to license my art using their products. Note: When I use clip art images, they are mainly used in the background to add interest to my original art and are not the central focus of the work. And often they are altered and not recognizable as Dover clipart. Even though it is legal to use the clipart, I do not want my art to look like other artists work who use the same clipart. Caution! Dover allows an artist to use six to ten images in each copyright free clipart book for one project (i.e. collection of art). You need to get permission to use additional clipart images in the book if you wish to use them in the project. Also Dover may be changing their policy for recent clipart books. New clipart books may not be copyright free. I was informed by an artist that is doing a book for Dover that her images in the book will not be copyright free because she is retaining all the copyrights. Thus, make sure that the images in the book is copyright free before purchasing the book if you wish to use them in your art. #15 Art licensing agencies always contact the artist when she/he submits art for representation. Art licensing agencies do not always and often do NOT contact artists that send queries to them in the hope that the agency will represent them. Agencies gets hundreds of requests a year and most do not have time to respond to artists or if they do it is a form letter that says something like, "Thank you for sending your art for licensing consideration. Unfortunately, we are unable to make a licensing commitment to you at this time." The reasons that an artist is turned down are numerous - the art is not suitable for licensing (read "Editorial: Not all art is licensable. "), the art is not good enough (read "Editorial: Is Your Art Goof Enough to License? "), they are already representing artists with a similar art style, they do not represent artists with the artists art style, etc. If the agency does not contact the artist, it probably means that they are not interested in representing her/him. #16 A good way to get a licensing deal is to send out e-mail blasts. An e-mail blast is sending the same e-mail to manufacturers on a list. This list can be hundreds of names but the problem is that sending e-mail to a large list is considered spam by internet service providers. Providers block or filter these e-mails and the recipient either does not get it or it is placed into a spam folder that the recipient is reluctant to open. E-mail blasts is the wrong approach in trying to license art. Even if a manufacturer opens the e-mail, the art may not fit their needs because it is the wrong theme at the wrong time of the year or the wrong art style for their company. Even if it takes more time, it is better to do more in depth research on what art is needed by each manufacturer and personalize an e-mail query. For more information, read "6 Tips in Writing Query Letters to Manufacturers that License Art." #17 A manufacturer keeps producing product with the same art if it sells well. In the good old days of retail sales, if an image on a product was selling well, the retailer would order more product with the same design. That does not seem to be the practice now except for some "Mom & Pop" stores. Once the SKU (stock keeping unit) sells-through it is not reordered. This is especially true in the big box stores because they do not keep product on the shelf for very long. Many times it is only three months or less and then discounted. Retailers continuously want new products with a fast sell-through. So that means that if an artist has a contract with a manufacturer to license her/his art, she/he may see a decent revenue the first year and have it drastically fall off the second and third year because the retailer does not reorder. Of course, there are exceptions and the product type has a lot to do with the reordering rate. For instance, I have seen some decorative flag art that has been in manufacturers catalogs for years. I assume that the art is still selling. I would be very interested in hearing other persons opinions and experiences on this subject! Make sure that you read the comments because readers HAVE chimed in on this subject. #18 You only need to follow-up once after contacting a manufacturer. Following-up once after doing the initial contact with a manufacturer is NOT good enough if you hope to license your work with them. Usually it takes multiple follow-ups before a decision is made. To learn more, read "Art Licensing Tip: What does follow-up really mean?" Joan, as always, excellent information you are sharing here! My experience with #17: Most retailers want new products, new art, every season. However, with online sales such as skins for electronics, we have offered the same art for a few years - we keep the best sellers and discard the least. I think it depends on the product and the market. In my experience also with #17, manufacturers have a longer production timeline for hardgoods (bikes, skateboards, helmets, electronics) and keep products on the shelf longer than softgoods (apparel, accessories, footwear)... This was the case for major licensor I worked for but I am not sure about home decor, bath and beauty aids, and other categories. Would love to know!